Jean-Francois Pilatre de Rozier was a pioneer of the aviation industry. He and his accomplice Marquis d’Arlandes made the first untethered hot air balloon flight on 21st November 1783. Less than two years later, on 15th June 1785 he set off from Boulogne, France in his ‘Rozier Balloon’ hoping to cross the English channel. A change in wind direction caused the balloon to fly 5km in-land, the balloon suddenly deflated and crashed. Him and his friend Pierre Romain died in the crash. A pioneer killed by his own invention. I think it would be insulting to Luis Enrique to say that this Barcelona side is purely Guardiola’s, and it would be insulting to Guardiola to say hiss career is dead but it’s true that Guardiola found it impossible over two legs to tame the beast he created. 3-0 to Barca in the first leg was slightly flattering, but it was clear to see that what Guardiola did didn’t work. Ironically, the best way to approach the second leg was to play in the same way he had the first, preventing Barca from playing from the back and putting a lot of emphasis on attack, thus risking leaving the defence exposed. This was the reason Guardiola stuck with the same XI he played in the first leg, with Lucho also naming an unchanged side. 4-1-2-1-2 base position shape for Bayern. 4-3-3 for Barcelona. The front line of Bayern’s press are restricting Mascherano’s options well, being in close proximity to Barca’s centre-backs while also cover-shadowing midfield options. Said midfield options are being closely marked by Schweinsteiger, Thiago and Iniesta. The aim is clear–to get Barca to play long and lose possession, however the one player that is not being picked up in this high pressing man-to-man system is the best player of all-time. It makes sense to force a team to play long balls when they have a short attack, which Barca do, but it requires all of the long options to be challenged. Mascherano plays the high ball to Messi, and Benatia is drawn forward to challenge him but doesn’t make it in time as Messi flicks it on to a now completely open Suarez, who can run through and play it to Neymar to make it 2-1 to the Catalonians. This would have been more balanced and effective. Somebody with no managerial experience has no right to criticise Guardiola and tell him what to do, but I’m going to do it anyway. The above image is how I think the press should’ve been set up, with Alonso guarding the important space in front of the defence, while Barca’s midfield options are still being well covered. Bayern man-marked players in central areas very tightly in their own half too. Bayern’s centre backs are stretched. Barcelona exploit Bayern’s tight marking by placing Messi and Suarez on the CBs. Messi pulls wide, pulling Boateng away which gives space for Rakitic to run into. Alves finds an open Rakitic who has his shot saved by Neuer. Alonso’s lack of pace costs Bayern as he isn’t suited to a high-intensity man marking game. Bayern’s high line was also exploited for Barca’s first goal. Their defence was completely unlayered, it was just a thin strip of seven men. Messi was given a lot of time to find a beautifully executed pass to Suarez who slipped in Neymar for the opener. Suarez and Neymar’s pace caused Bayern’s high line problems on many occasions. It shouldn’t be ignored that Bayern were very good in attack, having nineteen shots and putting three goals past a team that has only conceded 19 in the league all season. Bayern’s right wing attacking orientation. Also notice Barcelona’s compact midfield four. 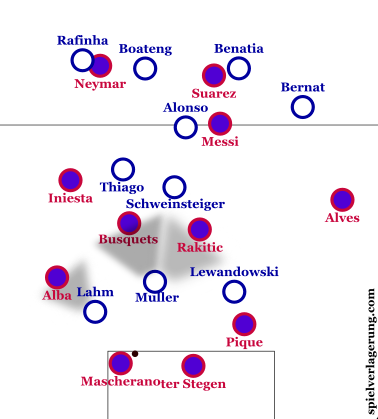 Bayern positioned men in between the lines of Barcelona, as well as trying to exploit the Mascherano-Alba partnership which is clearly defensively weaker than the Pique-Alves one. Instead of trying to put these wide overloads to best use as they normally do, through quick switches in play, they regularly tried to play through the laterally compact Barca block. This would meant that they could counterpress if they lost the ball and wouldn’t be so vulnerable in defensive transition. Many teams try to nullify Bayern’s attack by playing their defensive and midfield lines very close together. 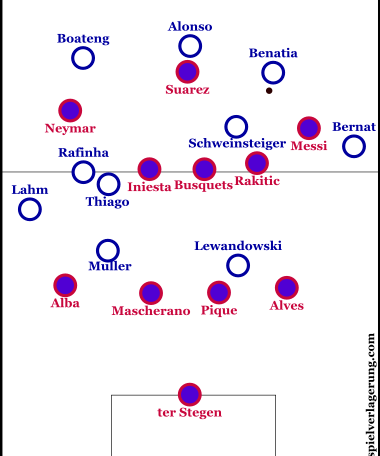 Instead, Barcelona left lots of space in between their midfield and defensive lines, using a tight midfield four/five to block passing lanes into Bayern’s attacking threats. This would also mean that Barcelona had more men higher up the pitch for an attacking transition. This shape (with Busquets unusually high up the pitch) worked fairly well for Barca in the first half however it cost them in the second, with Bayern scoring two goals from ‘Zone 14’. Bayern’s early build-up. Emphasis on the right-hand side. 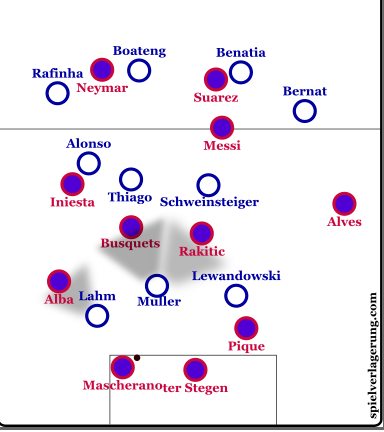 The above image emphasised what I have already talked about with Bayern’s right-wing orientation and Barca’s space between defence and midfield. It also shows how Benatia is the main instigator of Bayern’s attacks. He had 100 touches, the second most of any player on the pitch and passed it very well, with balls that split Barca’s tight midfield as well as some good reactive passes under pressure. Alonso moved into the back three in attack, and would be given the ball if there was an opportunity for a long diagonal ball. Bayern lacked players that could beat a man, and looked very dangerous when Thiago was dribbling past Barca players. Thiago should have been playing at no. 10 instead of Schweinsteiger and didn’t get into the final 3rd often enough. They missed Robben and Ribery in this respect. They also missed the two aforementioned wingers in attacking transition as they were often a two man band on the counter attack, with Muller and Lewandowski coming up against four Barca defenders. Barcelona were brilliant in attack over both legs. They were often forced to play long balls but it didn’t bother them, playing over the top of Bayern’s high line with success on many occasions. They are now favourites to be the European Champions, and deservedly so. Their biggest weakness was some of their individual defending, with Mascherano allowing Lewandowski to score in the second half, as well as Busquets losing Benatia from a defensive corner in the first half, leading to Bayern’s opener. Pep Guardiola has once again come up trumps against La Liga opposition in the semi-final of the Champions League. A disappointing result for Bayern but I’m sure that the Pep hot air balloon will be in full flight yet again next season. Great post-match analysis–I’ve read it a few times and it’s so spot on. I don’t have much to add to the conversation, except, I also don’t rate Mascherano at centre-half. I don’t think he’s poor, but it’s not his natural position. I would’ve perferred to see him as CDM and Mathieu/Pique. I hope Lucho sorts out their vulnerability before June 6th. Would you like to see him there over Busquets though? In my opinion the final showed that Mascherano can be very valuable as a centre-half. It also showed once again that Busquets is the best of world at CDM. So I think playing Mascherano at centre-half was the best possible solution, I´d rate him higher than Mathieu. Yeah, I agree, Pep went into the first game with the wrong mindset and it cost them, especially when Schweini and Alonso became tired due to the high intensity defensive play. Brilliant analysis. I did highlight in my blog when the ball was in the channels Bayern overloaded it particularly on that right hand side which left a lot of space on the opposite side. Bayern obviously missed Robben and Ribery in those wideareas and halfspaces but i feel they still could have won if they had tightened up defensively. Over two legs it was a fascinating spectacle with two teams trying to play football the right way, the pressing of both sides was so intense that neither side could settle into their usual possession-oriented style. By the way just out of interest Cameron what is your blog website? But can they be amongst the best in the world for 7-8 years like Messi and CR do? And does only scoring make you a better player? I don’t think scorers are most important but your impact in the score of your Team. Messi combines these things in a level I didn’t see anywhere before, so to me he is the besteht. Not in every game but in long term. I agree to that. Messi is the very best. He should even be in consideration for the best of all time. He just dominates games in a way never seen before. It would be unfair to compare Cristiano to him. Cristiano is a world class player, sure, but he is nowhere near Messi. He becomes more and more one-dimensional and he certainly lacks the football intelligence of Messi. He is an outstanding goalscorer, one of the best of all time, but he is very one-dimensional. In comparison, Messi is complete. He is the best goalscorer, the best playmaker and the best dribbler in the game. And has shown a remarkable consistency, probably never matched in the history of the game (Pele and Di Stefano come closest in my humble opinion). In addition, none of the players Vedat mentioned were BETTER than Messi, at no point. They were good, some of them great, but better? Come on. Could you explain why you think that? In one game “everyone” can be better than Messi but no one can do that over the course of just one year. And second Vedat limits his “better” to scoring more goals over a certain period of time in what I disagree. All those players were worldclass strikers/forwards but no one was also a worldclass deeplying playmaker, No.10, winger, etc. at the same time. I don’t think they were better than Messi is now either. They might have equalled his goalscoring qualities or technical skill, but never the combination. Why didn’t Bayern try to exploit Barcelona’s deficiencies on their right flank given Leo Messi’s lack of defensive output? That is, they could’ve overloaded Alves’ side and use a diametrically opposite strategy than the one they used? Another thing I thought after watching the game is that probably Lucho instructed Barcelona to play with a cautious approach than the first leg. What approach would Pep Guardiola have taken if Robbery and Alaba were present? What would’ve been Pep’s ideal lineup for this game if he had everyone fit? Do you think Bayern plays better than the way they played last year? Also, why is Masche-Alba a weaker CB-FB combo than Pique-Alves apart from the fact that they’re short? Suarez was subbed off at half time for Pedro. Would Andres Iniesta playing as a false 9 with Messi and Neymar flanking him and Xavi playing in the midfield been a better option than the one they used in the second half? 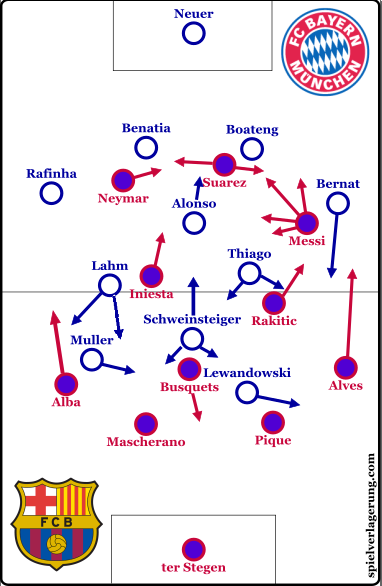 1) Bayern predominantly attack down their right side in most matches and saw Alba+Masch as weaker than Pique+Alves. Also, Barca’s midfield 4 in the defensive phase would’ve probably just shuffled across and Messi would have been higher, making it more dangerous for Bayern. 2) Yes Barca were probably a bit more cautious. 3)He would’ve put Alaba somewhere near Messi, either on LCM, LCB or LB. Robben would’ve allowed them to be more dangerous in attacking transition. 4)I’m not sure. Maybe a 4-3-3. 5) Yes I think they do. They have been doing a lot of what they did last year but better in my opinion. Pep has also become more adventurous with his systems. 6)I don’t massively rate Masch as a CB. Also, Alves>Alba. 7)No I don’t think Iniesta at f9 would’ve worked really. He was pretty important in midfield. In my opinion, I think Pep’s idea was to built the ofensive play through short passes/combination, down the right and than change quicky through a long and accurate pass from Xabi Alonso to Bernat on the left, so this one could face Dani Alves in 1v1. I also believe that Pep wasn’t counting with the great defensive work by Neymar… for me he was one of the MVPs in that game (and it was not only for is goals).